Lisbon has a serious affection for its patron saint, St. Anthony. Every June, the city honors him with the Feast of St. Anthony or the Sardine Festival, as it is also known. 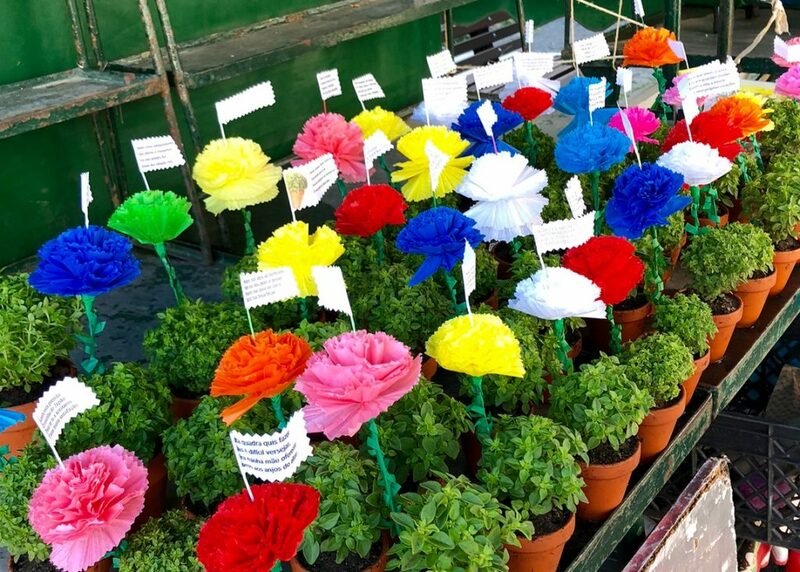 During this time of the year many of Lisbon’s streets and plazas, particularly those in some of its oldest neighborhoods, are cheerfully decorated in brightly colored garlands. Grill stations selling sardines and outdoor bars selling beer and sangria are set up everywhere. There are parties virtually on every street corner. Lisbon can get a little crazy, but this is a very special time to visit if you want to experience this very important cultural tradition of the Portuguese capital. We learned about all of this on day one in Lisbon, when we took a tuk tuk tour with Eco Tuk Tours of Lisboa. It was a great way to get our first taste of the city. Our fun and knowledgeable guide Nani told us many interesting things about St. Anthony and showed us the church dedicated in his name, as well as the St. Anthony’s museum. At the end of our tour, he took us on a neighborhood walk through the streets of the Old Town to experience the spirit of St. Anthony’s celebration or the Sardine Festival, however you would like to call it. We loved it! St. Anthony was a catholic priest and a friar of the Franciscan order who was born in Lisbon in the 12th century. 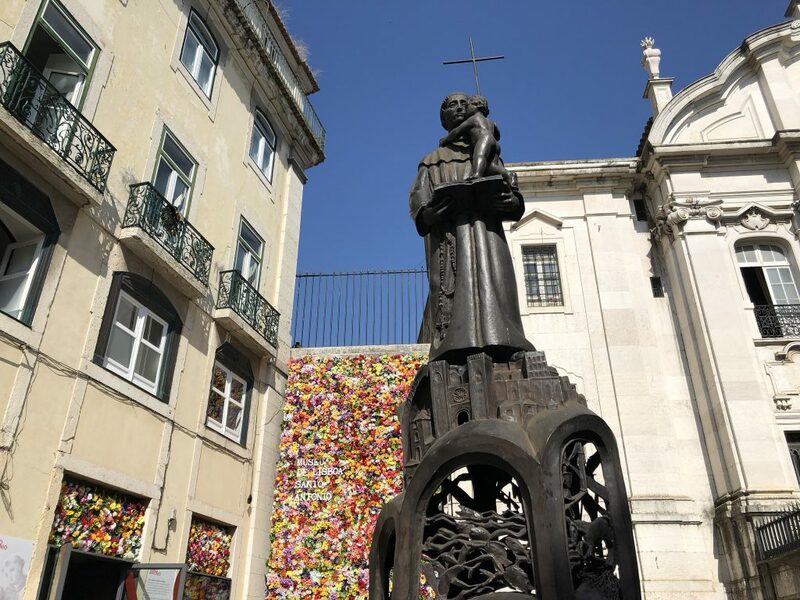 Many refer to him as St. Antonio of Padua because he spent many years in this Italian city where he also died, but the Lisboans are proud of his origins and refer to him as Santo António de Lisboa. St. Anthony was known for his powerful preaching and his devotion to the poor, sick and disadvantaged. Very popular during his life and even more so after his death, he was associated with many miracles. Apparently, he was one of the most quickly canonized saints in the history of the Catholic church. Lisbon is very fond of its patron saint, St. Anthony. There is even a museum dedicated to his name. St. Anthony is also known as the patron of missing objects. If you are curious as to why, you can read about it here. In the event your luggage happens to gets lost on the way to Lisbon, make sure to pray to St. Anthony, he might be able to help. But that is not all: in Portugal and its former colonies, he is also known as a matchmaker, the patron saint for singles. With that title, how could one not be popular? I read that traditionally, unmarried women in Lisbon would purchase a small statue of St. Anthony and bury it in the ground until they found a suitable partner. Once St. Anthony had worked his magic, they would dig it up and keep it close to the happy couple to ensure happily every after. These days, young girls try different methods to find out who they will marry. A popular one is writing down names of boys on small pieces of paper, which are rolled up and left overnight in a bowl of water, under their bed. It seems to be a big activity on the eve of St. Anthony’s day. In the morning, they check which piece of paper has unrolled the most, revealing their chosen one. There is another cute tradition that surrounds St. Anthony’s feast. This one involves a small plant, which the locals refer to as manjerico. It is a type of basil with tiny leaves and a strong, lovely sweet smell. The small potted plants of manjerico are given as gifts to loved ones and also used as decorations during the feast of St. Anthony. We were told it symbolizes newly-sprouted love. Traditionally, men give a manjerico plant to their object of affection on St. Anthony’s Day, June 13th. Each plant carries a piece of paper or a brightly colored carnation with four verses or a love message. No wonder it is known as the “Valentines’ herb”. The girls who receive the plant are supposed to take care of it so that it thrives. I love the symbolism! Manjerico plants at a street market in the Alfama neighborhood. On our first day in Lisbon, we saw these cute potted plants on many window and sold at tiny markets in the Alfama neighborhood. The next day we received one as a gift in the Benfica (local soccer club) store we visited on the famous shopping street, Rua Augusta. Maybe it was because they realized we were true soccer fans as we had gotten into a deep discussion about the World Cup, which was taking place while we were in town. Perhaps they liked the fact that our teenage son collects soccer jerseys from every destination in the world we visit and now it was time to add their club’s to his collection. Or, maybe it was simply the fact the we practically bought half of the store. Regardless, the gift felt very special! There is a peculiar fact about the plant I learned as soon as I leaned down to smell it and the friendly young employees quickly stopped me. Apparently, you should never smell manjerico directly. With your nose, that is. It somehow kills the plant. Instead, we were told to gently place our hand over it and then smell our hand. It worked. Cool stuff one learns when traveling! 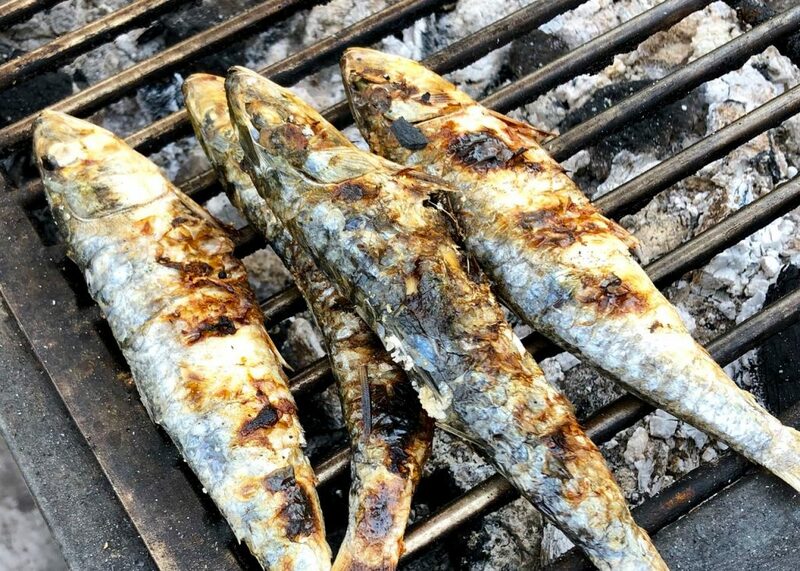 I thought sardines had a prominent role in St. Anthony celebrations simply because they were the national fish of Portugal. I’ve even heard people refer to them as the 7th wonder of Portuguese gastronomy. It would make sense, especially since their season apparently begins in early summer which happens to be the timing of the St. Anthony’s festival. Sardines have also been traditionally associated with the poor and St. Anthony had taken a vow of poverty, being a Franciscan Friar. However, we were told there is a deeper reason for the sardine association with St. Anthony. There is a cute legend involving St. Anthony and the sardines as everybody in Lisbon will tell you. When he tried to deliver a sermon while living in Italy, he was apparently ignored. He walked to the ocean and decided to preach to the fish instead and to everybody’s amazement, they all gathered on the water’s edge, lined up by size and listened attentively. Hence the prominence of sardines during the St. Anthony’s celebration. The funny thing, which we learned a few days into our visit, is that June is apparently NOT the best time to have sardines in Lisbon. The locals will tell you that while June is a lovely month to visit due to nice weather and city-wide celebrations honoring St. Anthony, it is not the month to eat sardines. Hmmm. Perhaps the festival should just be called St. Antony’s Festival and not the Sardine Festival? I have to admit that I’m not a huge sardine lover, but I obviously had to try some since we were in Lisbon and it was June, not to mention the Sardine Festival. As we were walking around some of Lisbon’s oldest neighborhoods, sardines were everywhere, just like I read before our trip. The smell of grilled fish and charcoal, floated throughout the city. I thought the sardines we sampled at one of the cute neighborhood grills in Alfama were fine and tasted like… you know, sardines. Would eating them another time make a difference? Apparently… yes and those who know a thing or two about fish (which is the case with many Portuguese), told us they don’t eat them until the end of July or early August. During that time, the fish are at their biggest, fattest and most importantly, tastiest. I had no idea, but now you do. I did notice that many sardine festivals around Lisbon and other parts of Portugal, like Mercado de Sardinha in Cascais, Festival da Sardinha in Algarve or Festas Do Barrete Verde in Alcochete, happen to all take place in early August. This could be the proof, I guess. 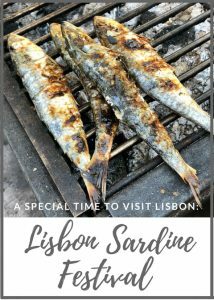 The actual Lisbon Sardine Festival takes place June 12-14 every year. 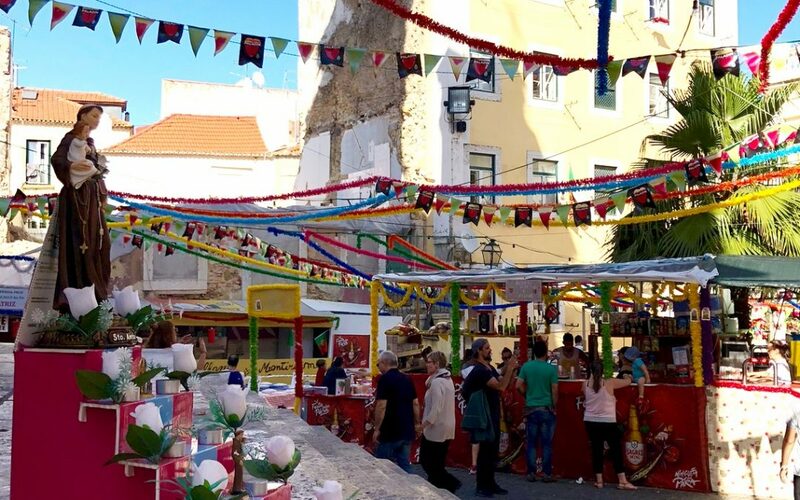 However, preparations for the festivities take several weeks as Lisbon gets dressed up for the occasion and the festive spirit is increasingly felt around the city in the days preceding the actual event. The day of St. Anthony is June 13th, which marks the day he died, but the city’s big festivities start the day before, on June 12th, with a giant parade on Avenida de Liberdade. The parade is a competition between Lisbon’s traditional neighborhoods which all participate with special choreographed dances and beautiful costumes. They prepare for this event all year. 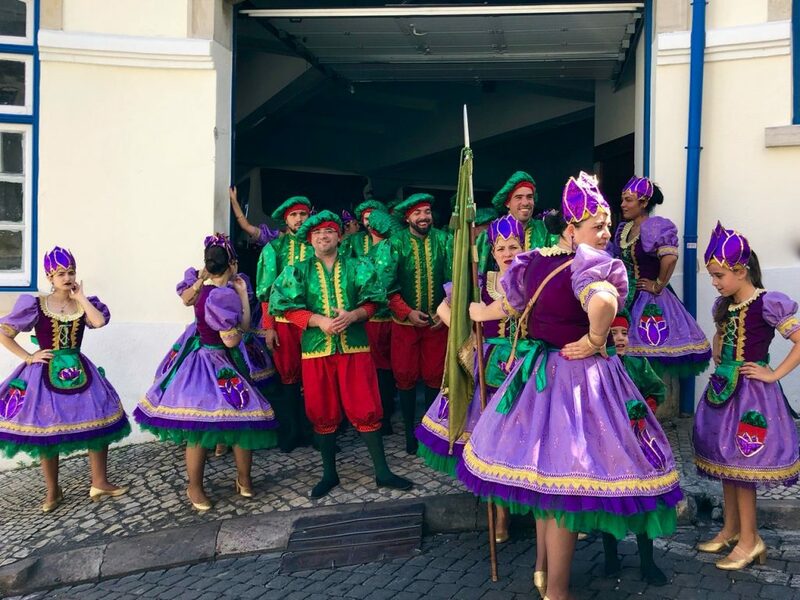 Dancers from the Alfama neighborhood preparing to show off their skills and costumes. On this day there is also a mass wedding celebration at the Igresia de Santo Antonio, the church of St. Anthony. This tradition, which goes back many years, originated to give cash-strapped couples a chance to get married. The lucky couples receive everything free of charge including the ring, wedding dress and honeymoon as part of an annual competition which is organized by the city council. The large joint ceremony is broadcast on national television. After the ceremony, many newlyweds join in on the parade. After the parade, both the participants and spectators fill the streets and city-wide celebrations in the form of eating, drinking and dancing last all night until sunrise. Lisbon is a city of cobblestone streets and many hills. Make sure to pack comfortable walking shoes to enjoy the festivities and your night(s) out on the town. Know that public transportation, which is great in Lisbon during the day, stops running in the evening. Buses normally run until 9:00 pm (a few popular lines a bit later) and metro stations shut down around 1:00 am (but many stations close before that time). Taxis and Ubers are equally a challenge during the festival given packed streets. If you can find one, that is. While restaurants in Lisbon generally take all major credit cards, credit cards won’t get you far with street vendors. Plan on bringing cash and, if possible, smaller bills to make things easier. Also, be prepared for long lines at food and drink stands. Be very aware of pickpockets. We were warned, repeatedly, that they are, unfortunately, a big issue in Lisbon at the present time. As you can imagine, they especially like this time of year because of the increased number of tourists and crowds.